I didn’t expect it was short, every episode was less than 15 minutes but it felt long! I guess, I was munching on it, enjoying every scene. I’m all about the heart and the simplicity of the story. Since it is raining on my end, to watch something sweet is all it takes to make this gloomy weather a little brighter. The harder thing is.. the possibility to find someone whom I fall in love with and the person also falls in love with me. Two strangers falling in love in Jeju island is a bit overdone. However, meeting a potential love in Jeju (or anywhere else) is like finding a rare gem. The two characters in “One Sunny Day” found exactly that kind of love. They were walking a different path and somewhere along the way, they meet. It was a brief encounter, but it was filled with happy memories. 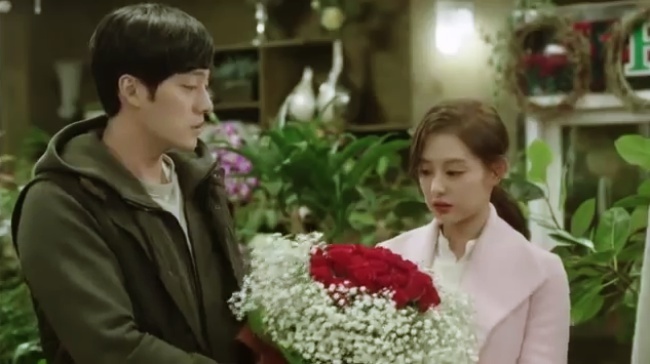 Kim Ji Won and So Ji Sub have chemistry, something that is planted to blossom in time. You will care about the characters they are playing, not the actors playing the part. It’s a good thing to enjoy how the characters evolve and live in front of you. Both actors did wonderful in that department and made me fall for them as the story unfolds. I love the fact their feelings for each other wasn’t rushed nor implied. It naturally shifted from being strangers stuck in one hostel, to finding comfort sharing their past, and enjoying each others company. There was an easiness between them that allowed enough room to be themselves, they weren’t trying hard to be noticed. It’s nice to get to know someone in his truest form. The characters here are raw and empty, they unexpectedly filled up each other. The story’s tone is very simple. Love doesn’t have to be complicated. I enjoy a story with this kind of structure, every now and then. This is my cup of tea, especially in this cold weather. So Ji Sub is a bonus. Seeing him in a different light and falling for him all over again is such a treat for me. He’s so simple yet brimming with charms. Though he’s problematic and lonely (yet again), he is still endearing, and funny. So Ji Sub successfully kept me smiling even if he was just staring out the window happily eating a bowl of seafood noodles. I don’t want to spoil too much of the story by revealing it all here. I assure you, you have to watch this series and experience it yourself. I’m a cheese ball, and I can just rant talking all about the romance. However, I don’t want you to see it through my eyes. Waste some of your time and walk with the characters. Enjoy! I loved it too! It was seeing SJS doing a real romance devoid of comedy! Though I liked Master’s Sun, this is one genre is really doesn’t do very often and this was really refreshing to see. WE love SO JI SUB, we’re following his music and drama. Such a great talented man. Keep it up!